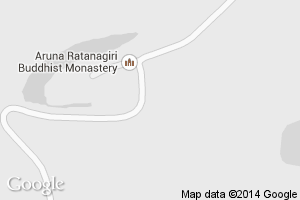 Formal Meditation Retreats at Aruna Ratanagiri are held at Kusala House, our guest facilities, located adjacent to the main monastery buildings, and are open to both men and women (unless otherwise indicated). Meditation instruction is provided by the senior monk leading the retreat, with periods of sitting and walking meditation typically scheduled for the morning, afternoon and evening. A Dhamma talk usually follows the evening sitting. Please read the Retreat Information here before applying for any of the retreats. Please note we do not currently offer facilities for purely personal retreats. If you are looking for a less structured stay in the monastery we accept guests outside of Formal Retreat times where there is generally plenty of time for private practice. See Visiting and Staying. Strict observance of silence is usually required during periods of formal retreat. During other times it is asked that guests observe silence from 9pm until 6.30am. Guests may be asked to leave if they do not follow the request for silence. As there is limited space on the retreats, the monastery adopts the policy of a maximum of two retreats per person in any one year and it is a requirement that you have previously stayed here or at another monastery in the tradition of Ajahn Chah. Please read information regarding the Eight Precepts and the standard of behaviour required of guests staying at the monastery: Visiting and Staying. To apply to join one of the retreats listed below, please download and fill the application form and email it to retreats@ratanagiri.org.uk (details for sending it by post are given on the form).